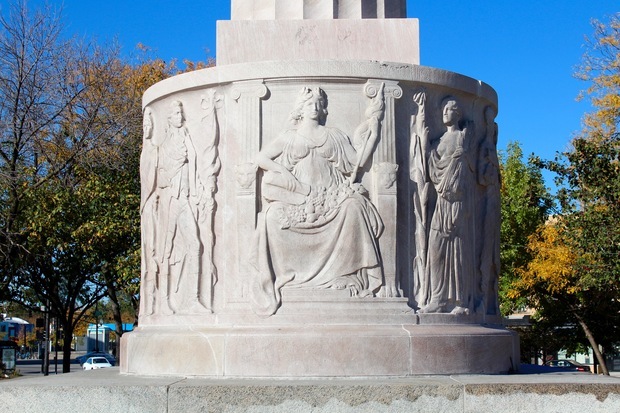 The Illinois Centennial Monument is getting its first checkup after 98 years. LOGAN SQUARE — The Eagle is getting its first check-up in 98 years this weekend. Don't be alarmed if you see a towering 90-foot lift in the center of Logan Square Friday and Saturday. The Eagle, also known as the Illinois Centennial Monument, will be getting a full inspection. 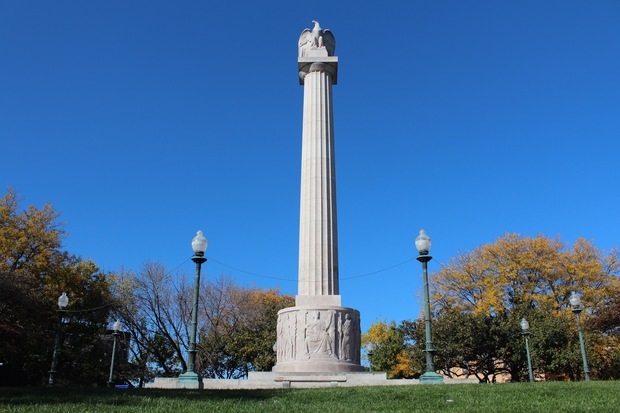 "For the first time in the entire monument's history, they are going to send someone up to the top by the eagle to give it a scan," said Andrew Schneider, president of Logan Square Preservation. The inspection of the 98-year-old monument is purely preventative. The effort will also include a laser scanning of the entire 70-foot tall marble column and eagle. "The hope of this diagnostic and inspection is that these guys come down and [say], 'Yep, everything looks good,'" Schneider said. The $6,000 inspection and laser scan is being paid for with help a neighborhood beer fundraising effort, a rare poster sale and the B.F. Ferguson Monument Fund. The Ferguson Monument Fund was a $1 million donation from Benjamin Franklin Ferguson to the Art Institute of Chicago to maintain statues and monuments in the city. The funds from the beer fundraiser were raised by Land and Sea Dept., Logan Square Preservation and Revolution brewery with a special brew named "Monument." Monument has been on sale at 25 Logan Square bars and eateries since June with $1 from every sale going toward an effort to preserve the neighborhood centerpiece. Money raised from sales of a limited-edition print of a 1923 poster of the monument is also going toward this weekend's inspection. The inspection will be both of the integrity of the monument to make sure there are no cracks, the monument is structurally sound and not tilting. There was heavy construction in the neighborhood in the late '60s when the city decided to dig a trench under Milwaukee Avenue and create the subway line. "At the end of this we will have a good idea of what's coming down the pipe from the monument," Schneider said. It was dedicated in 1918 to mark Illinois's 100 years of statehood. "This is the first time anyone's ever been eye-to-eye with the eagle since it's been built in 1918," Schneider said. "We expect it to be stable."